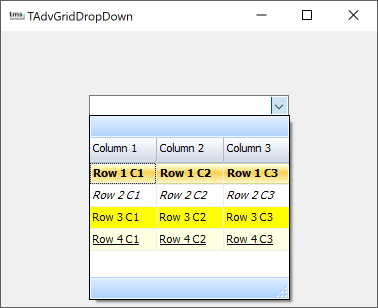 TAdvGridDropDown can hold the information shown in the dropdown grid in the Items collection. The component TAdvGridDropDown was designed to offer a customizable item collection. With a customizable item collection, additional properties can be added that control for example appearance or behavior of cells in the grid dropdown. In this sample, we apply this technique to create a TDropDownItem descending class where a Color and FontStyle property is added. This Color and FontStyle will be used to control the appearance of the items in the dropdown grid.